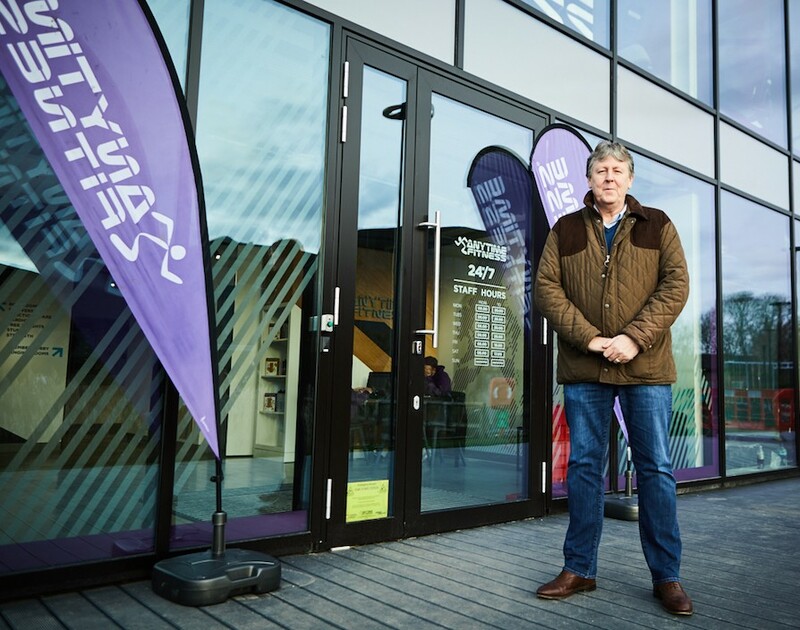 When arranging an interview with Stuart Broster, CEO of Anytime Fitness UK, it was decided the meeting would be at the gym franchise’s head office in Watford’s Croxley Business Park. Meanwhile, the photo shoot was to take place at the freshly-opened – as in so fresh I could smell the decorating materials on arrival – neighbouring gym, just a couple of minutes' walk away from the HQ. So you’d be forgiven for thinking such a prime location was an exclusive company-owned site but that’s not the case. “We have no company-owned sites – I think that’s a conflict [of interest],” says Broster. “I would avoid it as much as we could ever avoid it. I wouldn’t want to have owned clubs.” You may wonder why he’s so vehemently against the idea but it all stems back to his time in hospitality, during which he ran a hotel management business and, surprise, had no hotels of his own. “I used to say to the owners ‘We’re dealing with your business, we’re not looking after ours,’” he explains. “And if we had owned hotels people would say ‘Oh well, you’re spending all the time on your own hotels’. So I try to avoid it if I can.” Indeed, although the business does have the infrastructure in place to run its own gyms, it’s now at 160 franchise-owned locations, so clearly the franchisor is doing something right. But when Broster was just 18-years-old, it was the hospitality industry, rather than health and fitness, that he’d set out to make his name in. Having completed a Higher National Diploma on the subject at Buxton College, he set off for Scotland and started working. “Really like anything in life, you fall into something sometimes,” says Broster of hospitality’s lure. “I was working at a local restaurant and thought ‘Oh this might be good.’ Then [I started] to get some education and then went to Scotland.” Specifically, Glasgow-headquartered Stakis Hotels is where he got his break. After a tragic gas explosion struck at the Royal Darroch Hotel, one of the operator’s Aberdeen establishments, and resulted in several fatalities, the location Broster was working at in the city had sales double from £30,000 a week to £60,000 as tourists looked for somewhere else to stay. “It became a Stakis hotel,” he reveals. “So I was Stakis deputy manager, hotel manager, then I eventually ended up in Leicester and opened up a hotel, which was 160-bed and I then became a regional director.” From running one hotel to six to 12 to 60, Broster’s career had taken off. With Stakis being no stranger to acquisitions it bought LivingWell, the health club business, which paved the way for Broster to change industries and become managing director of the new subsidiary. It was a relatively straightforward transition too, as he took to the role like a member to the swimming pool. “I think when you work in the hospitality business, it’s not just a job, it’s a way of life,” Broster says. “So it’s difficult to get it out of your DNA. And I think from a health club perspective, you can offer a lot more understanding of what people want.” He points to the difference between hospitality events such as a wedding and a wake and says you become used to meeting people’s needs and acting accordingly. “So you do have to learn how to make sure you look after people, which is what the hotel business is all about – looking after people,” he explains. Although Broster wasn’t sure how long he’d be there and how the role would play out, he was in the post for five years and remembers it as “a great experience.” And even if it wasn’t as luxurious as hotel life in some ways, it made up for it in others. “I went from being served the tea to having to make my own tea,” he laughs. “You’d walk into one of the hotels and the first thing they’d say is ‘Would you like tea?’ and it’d come on a tray. When I went and became MD of LivingWell, I used to buy the milk.” He notes that while some people can’t trade up and down in their careers as easily, it’s an important skill to have because it allows you to appreciate change. The upheaval meant that the school she would board at for A-Levels no longer had accommodation, so they had no choice but to buy her a flat. It’s all part of working in the industry though, which is something he and his wife knowingly committed to and he says that they’re a “partnership”. “That’s made a big difference to some of the jobs I’ve had,” Broster says. “We’ve probably lived in 20 houses and, to be quite honest with you, if you don’t move then actually it’s quite difficult to get better jobs,” he says. On the theme of better jobs, the next opportunity that presented itself was back in the UK with gym chain LA Fitness, which came about through Broster being headhunted. With a handful of years clocked up at the business topping up his already rammed resume, he decided to go solo and flex his entrepreneurial muscles. “I thought the whole profile of hotels has changed in the UK, there’s no longer brands owning hotels, they’re all interested in franchising,” he opines. This trend was prolific in the States at the time but still on the rise in the UK, which is why Broster saw his chance to check in and run hotels on the behalf of owners, although the difference between Britain and the US was clear from the get-go. “The first six months I remember we never took any money, we never got paid,” he says. “We thought ‘This can’t go on forever’. I remember sitting down in an office in the one hotel we had at the time [thinking] ‘It’s got to change in the next month or so or it’s gonna get tough’.” That very next month Broster’s hotel management company picked up two more hotels. Then reached four, five, six, seven and kept going. “Once you get up to a certain level, as long as you keep your infrastructure under control then that’s the secret, isn’t it?” he says. That mindset has been demonstrable throughout his career, as evidenced by decades of adapting to companies of different sizes and in different sectors and, not least of all, his ability to buy milk for the team. And with Anytime Fitness UK, as the first British CEO appointed by the company because it had reached a size where the role was necessary to scale further and relieve investors of the burden, Broster had a blank canvas with which to create a masterpiece and age wasn’t a factor. “I’m 57-years-old but I don’t run the business like a 57-year-old,” he declares. “I try and run the business as if it’s fresh and change and think about things.” Admitting he’s not as IT-savvy as some of the team, he’s still keen to challenge decisions and put ideas on the table where digital is concerned. “I want them to learn from all the things I’ve done wrong not just the things I’ve done right and I think that’s quite key,” Broster continues. Technology is, of course, a development that’s entered the fitness arena. Despite Broster hearing from industry peers that they should all be fearful of virtual and technology, he disagrees. “Never be fearful of somebody that’s coming into the market, work out a way to work together,” he says. “I’m sure if Blockbuster had sat down with Netflix they probably would have had a great business because they would have had the database at Blockbuster, while Netflix had the technology. I think running away from your competition and future is the biggest mistake you’ll ever make. You shouldn’t run away, you should run together.” To that end, virtual classes and the app-based Anytime Coaching platform are moves the franchise made in keeping with Broster’s beliefs. Seery is the keen snapper who paps our cover stars each month. And she’s had plenty of experience, with a portfolio of shots of some of the UK’s hottest music stars as they strut their stuff on stage.